Options 4" 6" 8" 12"
Dogs have a strong natural urge to chew throughout their lives, and it would be nice if your friend had something besides your favorite shoes or a table leg to gnaw on! Rawhide Natural Pressed Bone helps to satisfy your dog's chewing instinct safely and appropriately, saving your household items. 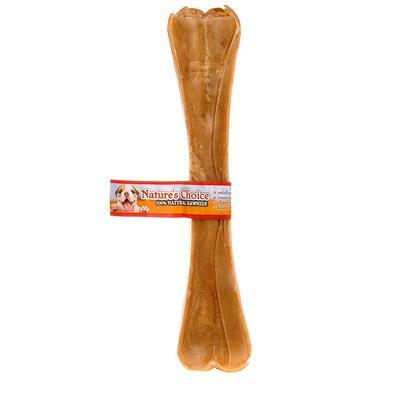 As your dog chews, Rawhide Natural Pressed Bone removes plaque and tartar. It also strengthens gums for good dental hygiene, reducing the need for expensive teeth-cleaning bills from the vet. Rawhide Natural Pressed Bone is made by fusing layers of cow rawhide under intense pressure into a dense core, resulting in an extremely durable and long-lasting product that's a great value for your money. You can feel good about giving it to your dog, too, because its 100% natural and edible and he will enjoy its great taste and pleasing bone shape. As per veterinarians, rawhide treats should not exceed 10% of the pet’s food intake. Take care to supervise the pet while they chew this rawhide as swallowing large pieces can be harmful.